Finally, CT to Become First State With Paid Sick Leave Legislation; Now What About the Rest of the Country? As progressives across the country struggle to beat back a wave of right-wing statewide legislation, their Connecticut counterparts are poised to celebrate a historic victory: the signing of a bill making their state the first in the nation mandating paid sick days. After passing Connecticut’s House and Senate over the past few weeks, the bill is headed to the desk of Governor Dan Malloy, who has backed it since his campaign. The Connecticut victory has emboldened activists pushing for similar legislation in New York City, Denver, Seattle, and Philadelphia – where the city council will vote on its own bill Thursday. 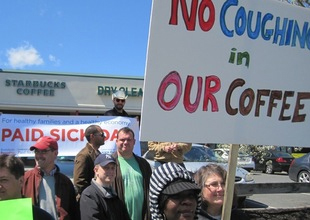 Read more from Alternet: Finally, CT to Become First State With Paid Sick Leave Legislation; Now What About the Rest of the Country? This entry was posted in Healthy workers, In the news, Paid sick days and tagged Connecticut, denver, Paid sick days, paid sick leave, philadelphia, seattle. Bookmark the permalink.